Christmas is one of the most important celebrations for Christians around the world, but it can also be one of the most stressful. Between the crowded shopping malls and people's expectations, we all run the risk of feeling let down, which can lead to tension and bad behavior. Avoid letting this happen by taking breaks to think about what the holiday is truly about. At its core, Christmas has nothing to do with standing in long lines, drinking too much, or expecting expensive gifts. It's more meaningful and rewarding to think of others. Those who celebrate the true meaning of Christmas can spend some time in prayer. Take a few minutes and enjoy some quiet moments with your children to help prevent your tension from affecting them. Most people enjoy receiving Christmas cards. You don't have to be wordy, but a nice thought above your signature can make someone's day. While it's okay to have a holiday newsletter enclosed, keep it brief and positive. Avoid too much bragging, or you'll have your recipients rolling their eyes. 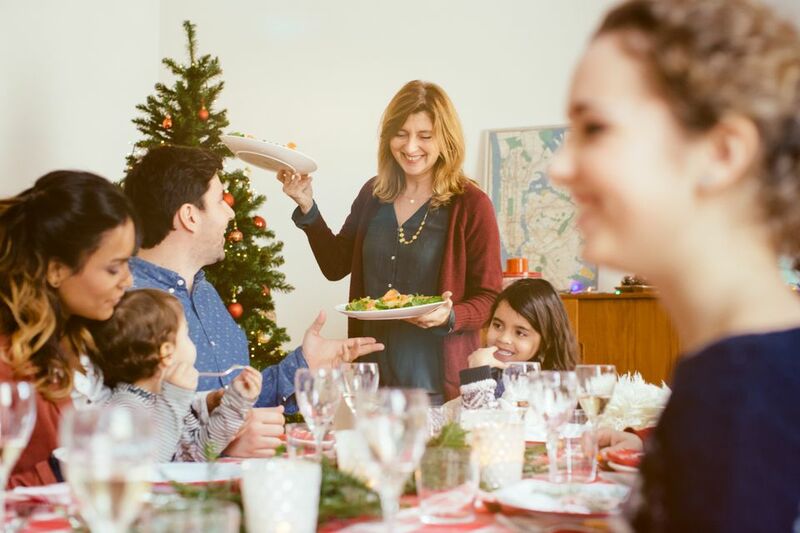 If someone has invited you for a holiday dinner, party, or overnight, be a gracious guest and mind your manners. Don't forget to bring a gift. If you drop or spill something, clean it up to the best of your ability and let the host or hostess know. Offer to cover the cost of a cleaning bill. Greet everyone at the door and make small talk with everyone. Introduce guests to each other. Have plenty of food and activities for everyone. This is the time to use your best dishes and flatware. Do as much preparation as possible the day before so you can enjoy the party with your guests. Keep an eye on anyone who is drinking alcohol and never let anyone drive if they've had too many. If anyone offers to help clean up, give him or her a single task and then thank him. You don't have to spend a fortune on gifts, but it is nice to have something for all your friends and family members. If funds are limited, bake cookies, divide them up, put them in clear bags, and decorate the package with colorful ribbons. Never expect a gift from anyone but be grateful for anything someone gives you. Keep in mind that the person took time to think about you and select something he or she thought you would like. If someone gives you something you can't use or don't care for, it's okay to regift it later, as long as you don't give it back to the original person. To prevent this from happening, attach a note with the original giver's name. It's always important to be generous with tips after you receive good service, but it's especially important during the holidays when you want to spread good cheer. When you go to a restaurant, get your hair done, or purchase any service, add a little extra to the tip. Have fun at the office party, but don't forget where you are. It is never okay to drink too much, tell off-color jokes, or get too chummy with the person in the next cubicle over. Laugh, make small talk, and enjoy getting to know your coworkers on a lighter level, knowing that you'll be back to work in a few hours or days. Spend extra time with your children or grandchildren and be prepared to remind them of the manners you taught them. It's easy to forget during the chaos surrounding Christmas. If you enjoy the Santa tradition, stand nearby and never take your eyes off your child. If your little angel starts talking too much and says anything you don't want strangers to know (your address and travel plans), don't hesitate to interrupt and change the subject. Make sure you thank Santa before you leave. As soon as possible after Christmas, send a thank you card to anyone who has given you a gift, hosted an event that you attended, or done something special for you. Do a good deed. Look for opportunities to perform acts of kindness and involve your children. Start a canned food drive and make a delivery to a food pantry or homeless shelter. Be generous when you see bell ringers in front of stores. Find a giving tree and purchase gifts for someone you don't know. Bake or purchase bakery cookies and deliver batches of them to your local police and firemen. Visit lonely residents at a senior center or nursing home. As you celebrate the holidays, put "be kind" at the top of your to-do list. Your rewards will be much greater than if you focus more on less significant things. Not only will you have a more joyful season, but so will everyone else around you.